This afternoon Jul. 23, I presented Tom Gallagher with his winning cheque for $220 from the 50/50 draw. 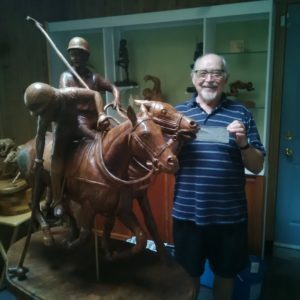 He is standing beside his wood carving of two polo players in full gallop. You can see some of his other carvings in the display case behind him, in his West Hill home. He was one of the woodcarvers at their Canada Day booth, where he bought the winning ticket from Steve, Dennis, & I. He already spent $130 on a big Chinese food meal for about a dozen of his woodcarver buddies, about two weeks ago. Tom was very happy to get his cheque, as it’s already spent.